We’ve all likely encountered passive-aggressive people at some point in our lives. Maybe someone keeps doing intentionally annoying things to “get revenge” for something you did. Maybe they constantly get snippy and sarcastic with you for no apparent reason – or, conversely, give you the silent treatment. Maybe one day it was your turn to take out the trash and you forgot…and you wake up to find the trash can outside your bedroom door. Passive-aggression is what happens when a person feels hostile toward you (aggressive) but won’t come right out and say what’s wrong (passive). Let’s look at some strategies for dealing with this type of behavior. It often seems easier to just ignore passive-aggressive behavior and hope it goes away. However, overlooking it can make the situation even worse. Not only will it cause unresolved tension between the two of you; it will set a precedent that they can do or say whatever they want to with no consequences. Since a passive-aggressive person typically tries to disguise their hostility, it’s up to you to bring it out into the open. Verbally acknowledge that you can tell they’re angry and you would like to talk about it. When two people are having problems with each other, the worst thing you can do is view it as one person versus the other, because this necessarily results in there being a winner and a loser. First, it’s important to address their behavior instead of ignoring it – but put yourself in their shoes, try to see where they’re coming from, and avoid accusing them or placing blame. Do your best to place the two of you on the same team instead of at odds with each other. Then, see if you can find a win-win solution to the conflict. Even if you think they’re being completely unreasonable, it’s best not to tell them that. If they’re being childish, don’t snap at them to stop acting like a toddler. People don’t appreciate being told that they’re overreacting – especially if they are – and you’ll only put them on the defensive. Chances are that if you respond calmly and let them know you’ve heard their concerns, they’ll come around on their own. You can't change a passive aggressive person – you can only control how you react to their behavior. As much as we might like to sometimes, the truth is that we can’t change what other people do or say. 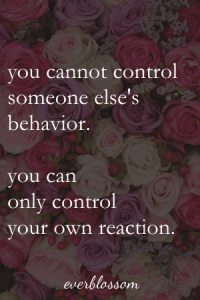 However, what we can do is control our response to it. If you can train yourself to not let other people’s behavior make you angry or irritated, you have an automatic ticket to a less stressful life. Keep your cool. If they try to bait you, don’t take it. When starting a conversation with a passive-aggressive person, try to keep these things in mind: bring up their unacceptable behavior but don’t discount their feelings, and let them know your side of the story but be prepared to admit that you’re not perfect either and you may have made mistakes. The point is not necessarily to “win” the argument; it’s to soften them, get them to meet you at a middle ground, and (hopefully) set the stage for them to respond in a healthier way next time they’re annoyed with you.